View the semi-final fixtures of the Final Four tournament. 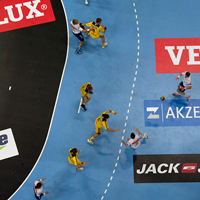 Parallel to the registration procedure to the 2011/12 VELUX EHF Champions League the EHF received a total of five applications for a participation in the Wild-Card Tournament for the 2011/12 VELUX EHF Champions League. This tournament will be played in a Final Four style with two semi-finals and a final on the following day. The request from the Danish Handball Association for the club of Skjern Handbold was rejected. The EHF is awaiting applications from the four participating clubs for the organisation right of the Wild Card Tournament these days. The tournament will be carried out on 03/04 September 2011. The pairings of these semi-finals remain unchanged regardless of the venue of the tournament.